Click&Clean is a free, fast and easy-to-use extension for Chrome that can be used as a powerful private data Cleaner. It's one of the top-rated extensions in the Chrome Web Store and are actively used by over one million home users, small-business owners, everyone who want to protect their browsing history and other private information from third party data collection or snooping. Protect Your Privacy.Why should I use Click&Clean? Your browser and system keep tracks of your Computer and Internet activity. Web sites and apps may gather cookies or otherwise collect personal information about you. What's the risk? Anyone with access to your personal information may use it for their own selfish purposes, for example share your private data with advertisers. By using Click&Clean, you can protect your private data and feel more safe and secure. How is Click&Clean different from similar software? Usually, when you run any other cleaning application, an error message will prompt you to close Chrome to complete the deletion. With Click&Clean you don't need to close your browser, because it uses built-in Chrome capabilities together with an advanced smart-cleaning techniques. Click&Clean allows you to perform safer and more deep cleaning without disturbing your work and does all that with one click! You can choose one of the predefined cleaning modes: Low - Medium - High and Dev mode - an advanced mode for experienced users and developers. You can remove your browsing data from the beginning of time or from a certain period of time: from the past 1-24 hours, from the past week or choose any date and time you wish. You can delete all your private data at once or just a specific items: Delete Browsing History - Delete Download History - Empty the Cache - Delete Cookies - Clear Saved Passwords - Clear Saved Form Data - Delete Local Storage - Delete WebSQL Databases - Delete Indexed Databases - Delete File Systems - Empty Application Cache; Delete Plug-in Data; etc. Download latest CRX file from our website, 100% clean, scanned by Virus Total . Open the Chrome extensions page chrome://extensions and enable "Developer mode" at the top right. Drag and drop the CRX file into the extensions page to manually add the extension to Chrome. 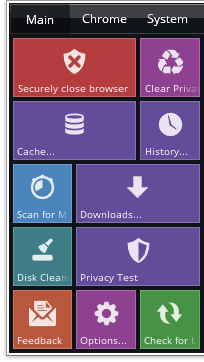 Click&Clean is a finalist for Best Privacy and Security add-on of 2014 ! How to adjust Click&Clean settings and bring your security and privacy online to a whole new level. If you have any suggestions, questions or comments about Click&Clean please use our support form.